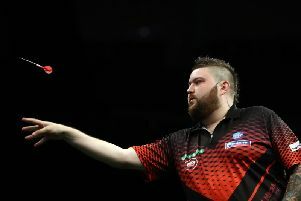 St Helens trio, Dave Chisnall, Michael Smith and Stephen Bunting, will be among 64 competitors in the £460,000 Ladbrokes Players' Darts Championship Finals which get under way at Butlin's, Minehead, tomorrow (Friday). Chisnall comes face-to-face with Welshman Jamie Lewis and will be favourite to reach the second round. Bunting, who in recent weeks has seen an upturn in form, locks horns with Romsey's Richard North and is expected to have too much firepower for his rival, while Smith - currently no. 9 in the world rankings - takes on the totally unpredictable Vincent van der Voort from Holland. Both are extremely quick players but it would be a major shock if Smith failed to overcome the Dutch Destroyer at the first hurdle. Winner of the tournament will take home a first prize of £100,000 and the runner-up £40,000. Format - first and second round (11 legs), third round and quarter finals (19 legs), semi-finals and final (21 legs). Matches will also be screened tomorrow, Saturday and Sunday by ITV 4.